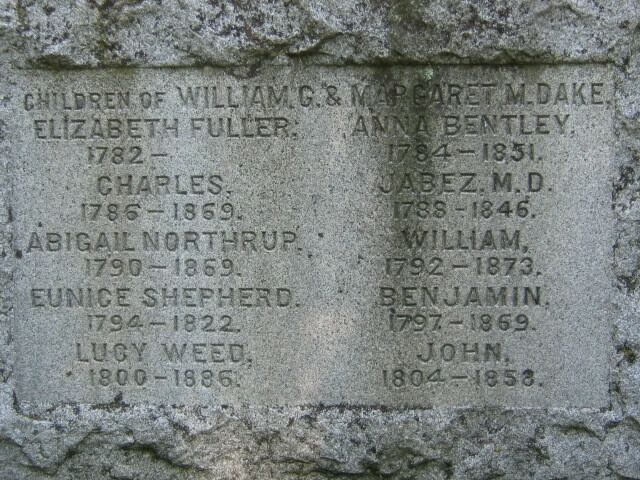 William was born March 6, 1761 in Hopkinton, Kings Co.,R.I. to parents Charles Deake and Anna Gould Deake. 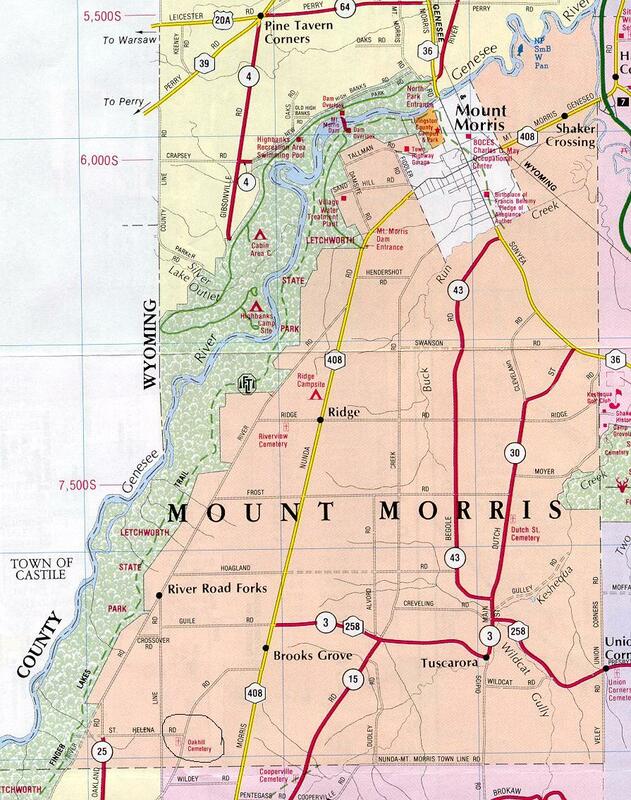 He moved with his parents to White Creek, Washington Co. N.Y. between 1772 and 1773. He was drafted in Sept. 1778 during the Revolutionary War, to go to Fort Edward in Captain Whitesides Company, Col. Lewis Von Woerts 16th Regiment of Cambridge. He was out on two or three sudden expeditions amounting to two and one half months. In 1779 he was called out to go to Palmertown for three or four weeks and during the same year he went three or four different times to Fort Ann and Fort Edward. When the enemy was reported as coming to rebuild Ticonderoga he was called out to go to Lake Champlain. In Sept. 1780 he left on a 3 month expedition serving under Captain William Brown, Col. Von Woerts' 16th Regiment to Palmertown, Fort Ann and Fort Edwards. After remaining there three weeks they returned home. The day after arriving at home they were ordered back because the British had captured and burnt Fort Ann and Fort Edwards. They pursued the enemy as far as Lake George and were gone eight days. In 1781 he was called out on a sudden alarm amounting to one month. He was later allowed a pension claim for six month service as a Private in the New York Militia at $20 per annum. (Certificate 31750 issued May 13, 1840, Act of June 7, 1832 at Albany Agency). He also served in the Class of Ebenezer Allen in Col. Blair's Regiment. The following pay records were found: Oct. 9, 1780, nineteen shillings and five pence (Certificate 25290) and June 4, 1780, one pound, seven shillings and nine pence (Certificate 25317) See letter attached, in his own handwriting, which documents his service in the War. 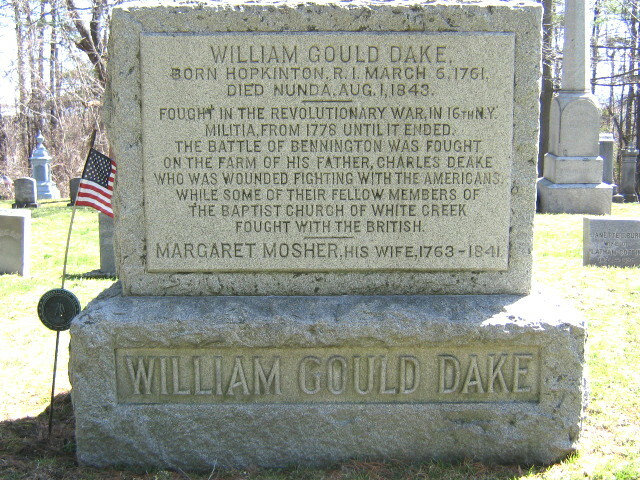 In an affidavit prepared by Attorney Frank B. Dake, we find the following statement: "I do further despose and say that amoung the things which my brother and I had for playthings in our childhood was an old flint locked musket which was carried by our said great grandfather, the said William Gould Dake, when he was a soldier in the Revolutionary war. That the said musket was then so much out of order that when I was about nine years old, my borther who was older than I traded the said musket to another boy in the neighborhood, named Madison Mosher, who traded it to a gunsmith named John R. Bennett, who resided in Nunda (N.Y.). I can now well remember hearing my grandfather, the said William Dake, say when I was a child that his father carried the said musket in the Revolutionary War." The following document is filed at the National Archives as his Pension Application for service in The Revolutionary War. The Deponent during the Revolutionary War lived in Cambridge then in the County of Albany now Washington County. That in the year 1778 the De ponent then being seventeen years old was enrolled as a Militia Man. & in September of that year was drafted to go to Fort Edward - he went there & was there three or four weeks until he was discharged & a part of the time while there they were employed on scouting expeditions. Major Chipman Commanded the Fort & the Deponent's Company was commanded by Captain Whitesides.- Afterwards during the same year the Deponent was out on two or three sudden expeditions. In the year 1779 this Deponent was called out to go to Palmertown & was at that place three or four weeks & during the same year he went three of four different times to Fort Ann & Fort Edward & each time was absent two or three weeks. In 1780 in the month of September the Deponent with others were ordered to Fort Ann & after remaining there three weeks returned home. The day after they arrived at home they were ordered back in consequence of the enemy having come on & burnt Fort Ann & Fort Edwards : They pursued the enemy as far as Lake George & were gone eight-days or thereabout previous to this & in the same year the Deponent was called out twice to go to Fort Ann. On Sept. 15, 1781, he married Margaret Mosher in Washington Co., N.Y. (She was the daughter of Jabez Mosher; born April 1765) On April 11, 1785, William signed a petition as part of the 16 Regiment of the Albany Company to make Captain Joseph Crary their new commander. (This was also signed by John Deake, Charles Deake, jr, Jabez MOsher, jr., Ebenezer Allen, Charles Deake and others). In the Spring of 1786, William moved with his parents Charles Deake and Anna Gould Deake, to Ballstown Township, Saratoga Co., N.Y. This later became Daketown, Greenfield Township. He later owned land in Saratoga Co., N.Y. Some time around 1811 the family name was formally changed to Dake. In 1828 he purchased fifty acres of land in the Town of Portage, Allegany Co., N.Y. (Now part of Livingston Co.) and on June 18, 1830 he sold his land in Saratoga to his brother Benjamin C. Dake and moved to Allegany Co., N.Y. (His son William Jr. had moved to this area in 1820) William Sr. purchased a large tract of land in Oakhill, Town of Portage, Allegany Co., N.Y. a short distance from his son William Jr. His farm joined what was called the Latham Coffin Farm. In the 1840 Census of Pensioners he was listed as living in Portage, Livingston Co., N.Y. at the age of 79. He lived on the farm until his wife Margaret died on Oct. 13, 1841 and then moved to the Village of Nunda where he lived with his daughter Abigail (Abbie) Dake Northop. 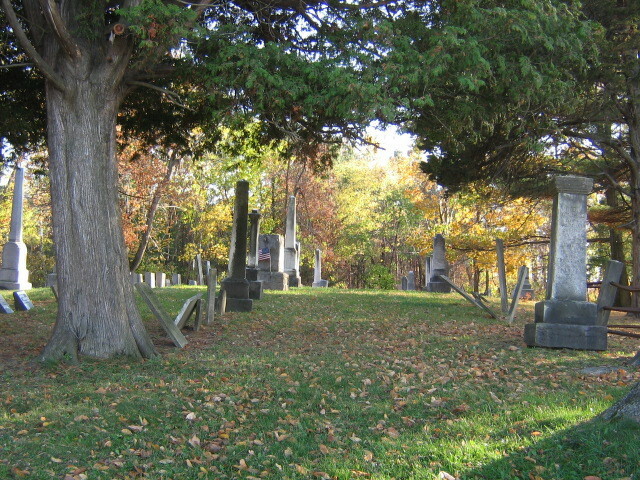 On August 1, 1843 he died of a natural death at the home of his daughter Lucy Weed in Nunda, Livingston Co., N.Y. and was buried in the Picket Line Cemetery, now known as the Oak Hill Cemetery, on Picket Line Rd., Livingston Co., NY (northwest of Nunda) next to his wife, which was only 2 miles from his original farm. At this time it was written in his obituary, "He was a man of genial mind and greatly loved. His last illness was short". His will indicated John E., Charles and Jabez as executors. WILLIAM GOULD DAKE, SR. LIVED NEXT TO SON WILLIAM G. DAKE, JR.